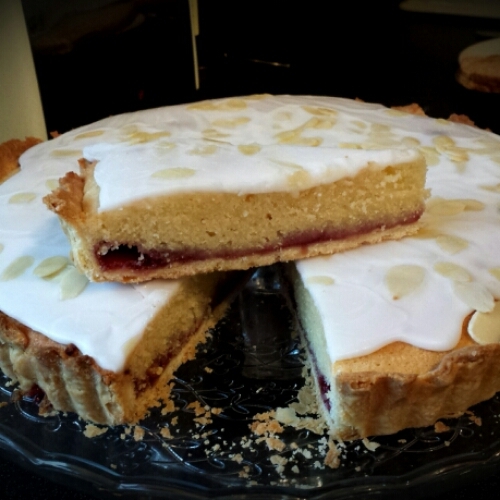 I love a good Bakewell Tart. Pastry, jam, sponge and icing all rolled into one delicious treat. Two tablespoons of ice cold water. In a processor pulse the butter, sugar and flour together and drizzle in the egg and water mixture very slowly until the dough just about starts to clump together. Tip the dough out onto a sheet of clingfilm and gently bring it together into a disk shape. Wrap in the cling and chill in the fridge for at least half an hour. Once chilled, roll out on a floured surface to about 2-3mm in thickness and line a large flan tin with it. Prick the bottom with a fork, line with greaseproof paper and baking beans, and blind bake for about 20/25 minutes, removing the paper and beans after about 15 minutes. While the pastry is baking make the filling by beating 200g unsalted butter with 200g caster sugar until fluffy, then beat in four eggs, one at a time, before adding 100g plain flour, 150g ground almonds, and a teaspoon of almond extract. 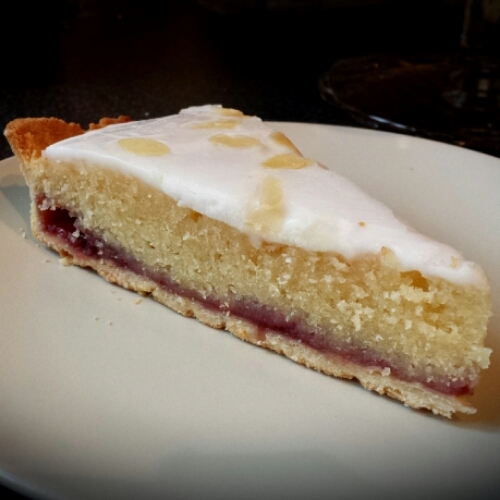 When baked, spread a generous helping of seedless raspberry jam over the base of the pastry case, then spread the frangipane filling over it. Bake for 30 minutes at 180oC or until the top is golden and the sponge in relatively firm to the touch. Allow to cool completely, ice with thick consistency icing and sprinkle over flaked almonds and the obligatory glace cherries if you have them (I’m not a fan of them though so ommited). Enjoy!